Based on an Atlas Potassium, the Atlas Volumetric Dosing System includes an Atlas Syringe Pump or Atlas Syringe Pump XL. The Atlas Syringe Pump is a versatile volumetric dosing and/or sampling system. It allows 2 independent refilling flows, one continuous flow, reaction sampling, intelligent control of pH and temperature dependant dosing. 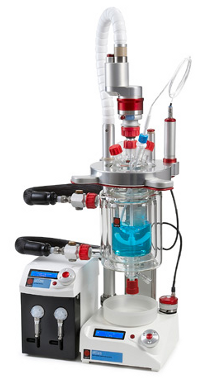 It consists of two syringes and multi port valves and can be controlled from the front panel, by the Reactor Master, an Atlas Base or PC software. Flexible: Use as 2 refilling pump channels or 1 continuous pump channel or an autosampler. Easy to use on its own: Twist and click control knob and large display. Automated reagent addition: Dispense simply by volume or flow rate over a time period or create advanced flow profiles. Automated reaction sampling: Use with the Autosampler module to regularly aspirate samples into 2ml HPLC vials. Intelligent: Pump to control pH or pause if a reaction temperature is exceeded. Full data logging to a csv file. Compact size: Fits conveniently alongside reactor. Excellent chemical compatibility: PTFE, PCTFE and glass. 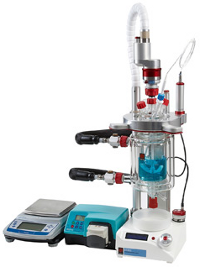 Based on an Atlas Potassium, the Atlas Gravimetric Dosing system allows a defined mass of reagent to be pumped from a balance to the reactor by a controlled peristaltic pump. The mass flow rate can be defined, monitored and adjusted by using the Atlas Software. Quick change vessel: The oil drain unit, jacketed vessel clamp and quick oil connectors allow vessels to be changed in under a minute. Automated reactions without PC control: Set points, ramps, or sophisticated profiles are all possible for temperature and stirring. Easy to upgrade: A wide range of accessories are available including vessels, stirrers, probes, etc. Wide flow rate and mass ranges: 1ml/min to 2 litres/min and up to 4000g. Advanced control: Define the mass to be dosed as a set point or sophisticated profile (in table or graph form). Data capture: Download all data to a USB stick in .csv format. Small footprint: 23cm (9”) square easily fits into fume cupboards. Wide temperature range: -80 to +200°C. Easy to use: The Gravimetric Dosing system can be set up quickly and without the need for any tools. Robust: Specifically designed for use in chemical laboratories.